Alex's Author Bio: Alex is a journalist and technology blogger. He is a mac fanatic and writes about everything from SEO to ADSL and from free apps to the quickest way to find a phone number online. Desktop Computers Destined for the Scrapheap? The IBM Personal Computer (PC) was thirty years old last Friday, and according to those in the know, it might not be around for much longer. A blog post by Dr Mark Dean, one of IBM’s longest serving and most respected computer designers (who helped build the classic IBM 5150) has been making big waves across the technology sector after he claimed that the PC was heading in the same direction as vinyl records and the typewriter, light bulbs and the vacuum tube. Dr Dean points out that PC’s and cheap laptops have had their time and place but that now they have helped to create a world which needs a new type of device depending on use and form. When IBM released the 5150 in 1981 it soon set the standard for how PC’s were to look and operate. 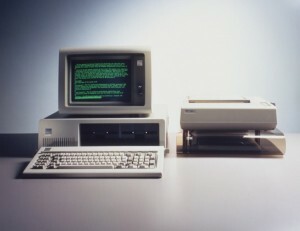 The computer, which had a massive 16k of ram and cost more than $1,500 was one of the computers that began the ‘PC Era’, that revolutionized the way we work and live. According to Dean, such a revolution is also underway once again. He is not alone – in another blog about the 30th anniversary of the PC, Microsoft’s Frank Shaw argued that the proliferation of tablets, phones and other such devices was the beginning of a new ‘PC Plus Era’, if not necessarily an indication of the end of the PC and traditional computer devices. So what do you think? Are you ready to ditch that PC just yet? A recent study of online browsing habits in the UK revealed that Google Chrome is now the browser of choice for more than 23% of British internet users. More surprising still was the fact that it is now more popular than Mozilla’s Firefox and is even gaining ground on the current and ever-present browser bruiser, Microsoft’s Internet Explorer. Currently Internet Explorer has a whopping 45% of the market share in the UK but that figure is down from the year before and the use of IE seems to be constantly declining. This loss of popularity for the ubiquitous Internet Explorer is even more depressing for Microsoft when you weigh up the fact that the browser comes pre-installed on nearly all UK computers at the moment. Google Chrome’s figures and market share are all the more impressive when you consider that it was only released three years ago. Commenting on the UK figures Google put Chrome’s increasing popularity down to two things – firstly that they had promoted it with a blitz of advertising across the billboards and televisions of the United Kingdom (Chrome was the only time they have ever put an advert on British television); and secondly that they believed it was the best browser in terms of security and speed. Certainly the numbers for the uptake of Google Chrome are astonishing. At the current rate Google Chrome’s success in the UK will be replicated worldwide very shortly. It is already in third place with a market share of 21% across the globe and is expected to overtake Firefox in the next year or so. Similarly it is predicted that it will be challenging IE within two or three years. Google are banking on Chrome becoming so popular that it will offer a similar kind of ‘Halo Effect’ as the iPod did with Mac computers, and lead them to purchase the new Google Chromebook laptops. The Chromebook will be cloud based, with the Chrome browser being central to a different kind of operating system. Instead of taking up memory storage, data will be cloud based so as to make the Chromebooks as fast and clutter free as possible.